Graduate students Matt Rollins and Zeb Nevins and assistant adjunct professor of computer engineering Brad Smith in the NMO Lab. Photo by T. Stephens. Students in the Baskin School of Engineering at UC Santa Cruz are getting real-world experience in computer networks through a partnership with San Jose-based Cisco Systems, a leading provider of networking equipment and services. Cisco has provided funding and equipment--and challenging real-world problems--for teaching and research laboratories at the engineering school, enabling UCSC students to work directly with Cisco engineers on networking projects. The program--the Network Management and Operations (NMO) Lab--has been a big hit at both Cisco and UCSC, according to Brad Smith, adjunct professor of computer engineering at the Baskin School of Engineering. "Some of the students have told me it was a life-changing experience to have that real-world connection to what they're learning," Smith said. "And the students have been a big success at Cisco. As word spread within Cisco, the program has begun growing faster than we expected." Space and staff support for the NMO Lab are provided by the Center for Information Technology Research in the Interest of Society (CITRIS), of which UC Santa Cruz is a member. CITRIS, a partnership between four UC campuses and 60 corporations, looks at information technology in terms of solutions to the world's most pressing social, environmental, and health problems. By providing Baskin and Cisco the physical space and management for operating the NMO Lab, CITRIS enables Baskin students and faculty to create networking innovations. The Baskin program was initiated by Joe Pinto, senior vice president for technical services at Cisco. Pinto has worked to strengthen relationships between universities and the high-tech industry for a long time. To celebrate Cisco's partnership with Baskin Engineering, Pinto will deliver the final talk of the academic year in Baskin's Distinguished Lecture series: "Engineering Smart and Web-based Systems to Support Customers in a Global Economy." 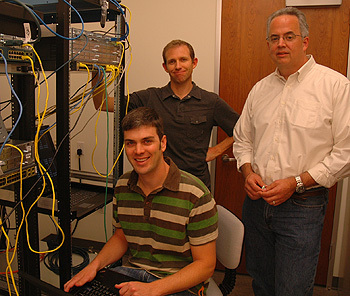 The creation of the NMO Lab and Cisco's earlier gift of a teaching laboratory for the Computer Networks course have led to curriculum changes at Baskin, according to Smith. A lab component now accompanies the Computer Networks and Network Administration courses. The NMO Lab and the opportunities to work with Cisco make it possible for Baskin to teach these courses annually, and enrollments are increasing each term, Smith said. Currently, about 10 undergraduates and several graduate students are involved in Cisco projects. For the undergraduates, it is a funded internship, made possible by Cisco. For graduate students, the Cisco-funded graduate-student research stipend supports their work on real-world problems they can address in master's theses. Through their projects, the students are able to earn entry-level Cisco certification for networking technicians. "This is a great example of the kinds of partnerships and collaborations that the Baskin School of Engineering is establishing with Silicon Valley industry. We're very pleased to have Cisco as our partner," Smith said.